Tuesday’s quick post about a letter of opposition to Plan S generated some comments from academics about the role of “Learned Societies” in academic publishing. I therefore think it’s relevant to raise some points about the extent that these organizations (including, in my field, the Royal Astronomical Society and the Institute of Physics) rely for their financial security upon the revenues generated by publishing traditional journals. Take IOP Publishing, for example. This is a wholly-owned subsidiary of the Institute of Physics that has an annual turnover of around £60M generated from books and journals. This revenue is the largest contribution to the income that the IoP needs to run its numerous activities relating to the promotion of physics. A similar situation pertains to the Royal Astronomical Society, although on a smaller scale, as it relies for much of its income from Monthly Notices of the Royal Astronomical Society, in which as a matter of fact I have published quite a few papers. Not surprisingly, these and other learned societies are keen to protect their main source of cash. When I criticized the exploitative behaviour of IoP Publishing some time ago in a recent blog post, I drew a stern response from the Chief Executive of the Institute of Physics, Paul Hardaker. That comment seems to admit that the high prices charged by IOP Publishing for access to its journals is nothing to do with the real cost of disseminating scientific knowledge but is instead a means of generating income to allow the IoP to pursue its noble aim of “promoting Physics”. This is the case for other learned societies too, and it explains why such organizations have lobbied very hard for the “Gold” Open Access some authorities are attempting to foist on the research community, rather than the far more sensible and sustainable “Green” Open Access model and its variants. There is also great incentive for the people who manage and run these organisations to defend their cartel. For example, the American Chemical Society, a huge opponent to open access, pays many of its employees, as reported in their 990 tax return, over six figures. These salaries ranged from $304,528 to $1,084,417 in 2010. The problem with the learned societies behaving this way is twofold. First, I consider it to be inevitable that the traditional journal industry will very soon be completely bypassed in favour of some form of green (or at least not gold) Open Access. The internet has changed the entire landscape of scientific publication. It’s now so cheap and so easy to disseminate knowledge that traditional journals are already virtually redundant, especially in my field of astrophysics where we have been using the arXiv for so long that many of us hardly ever look at journals. The comfortable income stream that has been used by the IoP to “promote Physics”, as well as to furnish its brand new building in King’s Cross, will dry up unless these organizations find a way of defending it. The “Gold” OA favoured by such organizations their attempt to stem the tide. I think this move into Gold `Open Access’, paid for by ruinously expensive Article Processing charges paid by authors (or their organizations) is unsustainable because the research community will see through it and refuse to pay. The other problematic aspect of the approach of these learned societies is that I think it is fundamentally dishonest. University and institutional libraries are provided with funds to provide access to published research, not to provide a backdoor subsidy for a range of extraneous activities that have nothing to do with that purpose. The learned societies do many good things – and some are indeed outstandingly good – but that does not give them the right to siphon off funds from their constituents in this way. Institutional affiliation, paid for by fee, would be a much fairer way of funding these activities. Some time ago I had occasion to visit the London offices of a well-known charitable organization which shall remain nameless. The property they occupied was glitzy, palatial, and obviously very expensive. I couldn’t help wondering how they could square the opulence of their headquarters with the quoted desire to spend as much as possible on their good works. Being old and cynical, I came to the conclusion that, although charities might start out with the noblest intentions, there is a grave danger that they simply become self-serving, viewing their own existence in itself as more important than what they do for others. The commercial academic publishing industry has definitely gone that way. It arose because of the need to review, edit, collate, publish and disseminate the fruits of academic labour. Then the ease with which profits could be made led it astray. It now fulfills little or no useful purpose, but simply consumes financial resources that could be put to much better effect actually doing science. Fortunately, I think the scientific community knows this and the parasite will die a natural death. The question for learned societies is whether they can find a sustainable funding model that isn’t reliant upon effectively purloining funds from university library budgets. If their revenue from publishing does fall, can they replace it? And, if not, in what form can they survive? Catching up yesterday evening with the Times Higher, I found yet another article about the confusion generated by RCUK‘s plans for Open Access publishing. 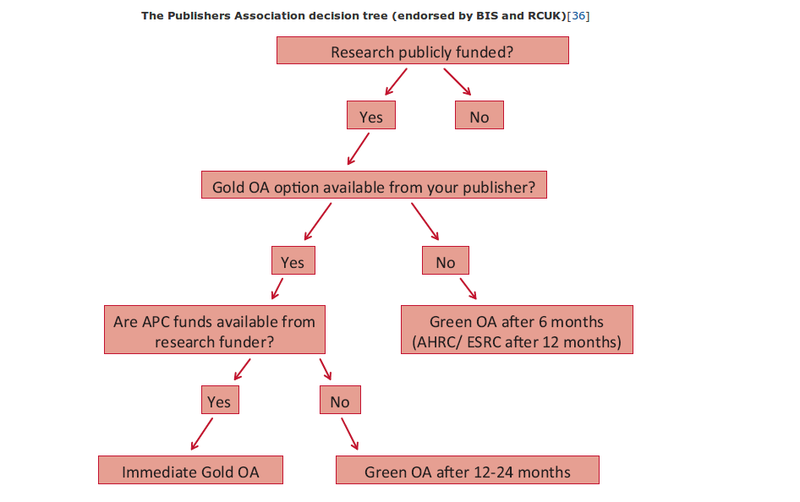 Apparently pressured by the powerful Publishers Association, RCUK has adopted the following “decision tree” to explain how its proposal will work. 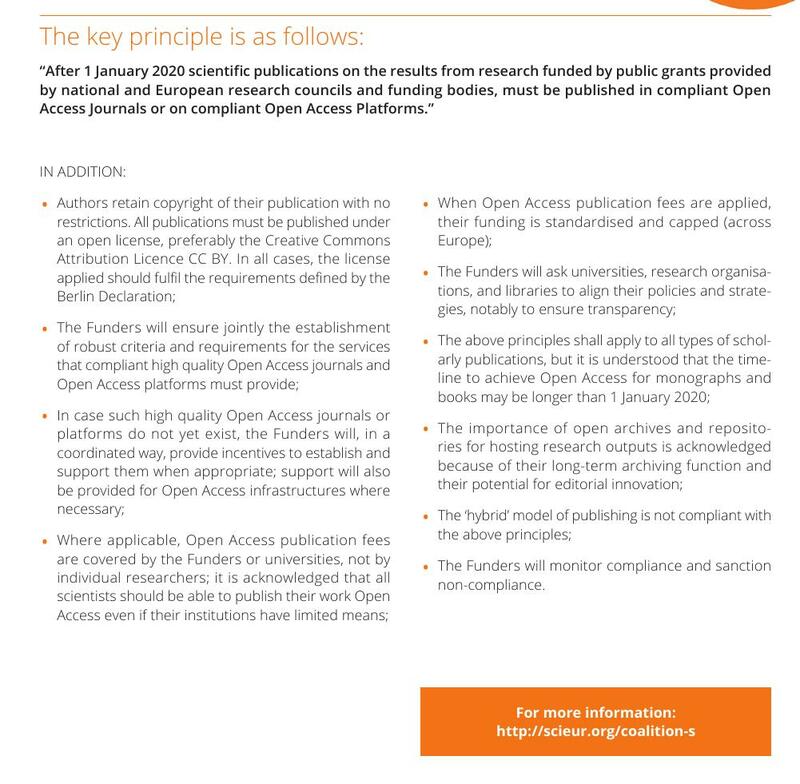 As you can see, this basically says that if you have any money from RCUK for Open Access you have to spend it on the Gold Open Access which means you have to hand it all over to a publisher. Only when you’re skint can you go Green, and even then you have to tolerate a lengthy embargo. This is as transparent a scam as you could ever hope to find. The Academic Publishing Industry is clearly out to fleece us for as much as it can get away with, bleeding our block grants dry before allowing us to do the right thing and publish our research the only sensible way, i.e. via Green OA repositories such as the arXiv. An RCUK spokeswoman confirmed that even when funding for gold is still available via universities’ RCUK-provided block grants, researchers could still choose the green option with its shorter embargo periods. But this reading of the decision tree was disputed by a spokeswoman for the Publishers Association. She insisted that if funds and gold options were available, researchers should choose gold. It is obvious from this exchange that the agenda is not being generated by researchers or the research councils, but by the Publishers Association, who have hijacked the entire Open Access debate for their own ends. Clearly the Academic Publishing Industry doesn’t live in the austere economy the rest of us inhabit – their profits are protected by generous dollops of cash from the taxpayer via RCUK. And the government seems happy to go along with this hefty backdoor subsidy. I wonder why? 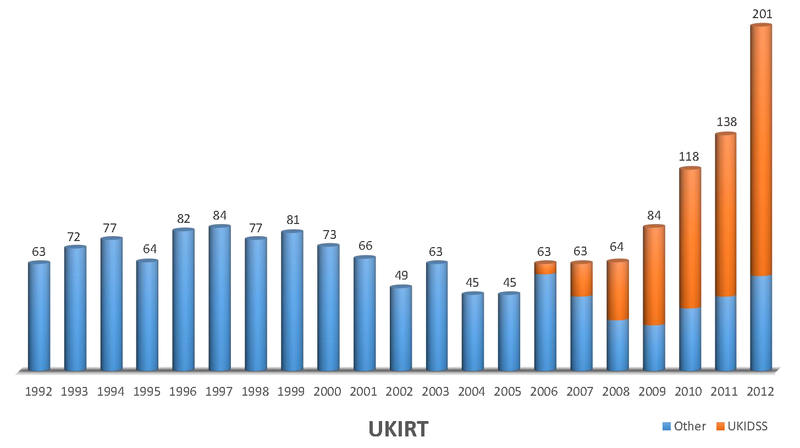 Interesting to note that 2012 was a bumper year for productivity at the UK Infra-Red Telescope (UKIRT), as demonstrated by the following nice graphic. Some of my colleagues have expressed a measure of consternation at the fact that unless some individual or organization steps in and offers to take over the running costs, this facility will be closed down at the end of this year (2013). Why shut down a telescope that is generating so many publications? The answer is of course that, under the UK Government’s new plans for Gold Open Access, astronomers will be forced to pay Article Processing Charges, possibly exceeding £1000 per paper, in order to disseminate the fruits of their research. The Science and Technology Facilities Council (STFC), which administers the budget for the UK’s astronomy research, simply can’t afford the level of expenditure required to cover the costs associated with the number of articles being generated by the wanton exploitation of this facility. Indeed, in future, STFC will only be able to operate facilities that produce very few results worthy of publication. Blogging this week will be a bit patchy as I try to finish off a few Cardiff jobs before the big move to Sussex at the end of the week. However, I have got time today for a quick comment on an article I saw in yesterday’s Observer. The piece tries argue that the government’s plans for Open Access, stemming from the Finch Report, amount to an “attack on academic freedoms”, a stance apparently held by a number of eminent historians (and others). The argument is that the Gold Open Access model preferred by RCUK will require the payment of Article Processing Charges (APCs) which could in some cases amount to thousands of pounds per article. Departmental budget holders (possibly administrators rather than academics) will then have to be involved in decisions about which papers can be funded and which can’t. This, it is argued, will mean that researchers will have much less freedom to publish when, where and what they like – the people holding the purse strings will have the final say. Even in the UK it is not clear how the flow of funding for APCs will work. Will universities limit an academic’s publication rate or where he or she can publish? How and by whom will this funding be controlled? Academic freedom may, perversely, be curtailed as a result of open access. So does Open Access pose a real threat to academic freedom? The answer is “yes”, but only if the Research Councils persist in forcing academics to pay the extortionate APCs demanded by academic publishers, out of all proportion to the real cost of publishing a paper on the internet, which is (at the very most) a few tens of pounds per article. Publishers want a much higher fee than this because they want to maintain their eye-watering profit margins, despite the fact that the “service” they provide has been rendered entirely obsolete by digital technologies. Any protests against open access should be directed to the real enemy, i.e. the profiteers. The Finch Report was hi-jacked by the publishing lobby, with the result that RCUK has been persuaded to pour millions of pounds of taxpayers’ money down a gold-plated drain. The model it recommends is absurd and clearly unsustainable. Low-cost repositories and community-based refereeing can deliver Green Open Access at a tiny fraction of the cost of the Gold Option, by cutting out the middle men. P.S. Astronomy & Geophysics have invited me to write a response to Mike Cruise’s article; my piece should appear in the April 2013 issue. Hopefully it won’t be behind a paywall. Right. Now I’m annoyed. Annoyed enough to dash off a quick post before getting the train to London to see this year’s RAS Gerald Whitrow Lecture. RCUK, the umbrella organisation for the United Kingdom’s seven research councils, has announced that it will set aside £17 million next year, and £20 million the year after that, to pay for Gold Open Access publication of the research it sponsors. These funds will be made available to universities in the form of block grants to enable researchers to pay the infamous APCs (“Article Processing Charges”). The average cost of an APC has been taken from the Finch report (estimated as £1727 plus VAT). It’s astonishing that RCUK have fallen for this trap. What were they thinking of? The Finch report was clearly hijacked by the vested interests of the academic publishing industry who see the Gold Open Access model as an easy way of maintaining their profit margins at taxpayer’s expense. The new RCUK scheme will simply divert funds away from research into a subsidy for wealthy publishing houses (and, in some cases, the learned societies that run them). The actual cost of processing an article is nothing like £1727 and is any case borne by the people doing the work, i.e. academics who perform the refereeing usually for free. An APC at this level is simply a scam. That the RCUK has fallen for it is a disgrace. What RCUK should have done was given universities and other research institutions funds to set up and maintain their own Green Open Access databases or international repositories like the arXiv. Throwing money at Gold Open Access is disastrous way of proceeding. It’s not only ruinously expensive but also unsustainable. In a few years’ time it is inevitable that the traditional academic publishing industry will be bypassed by researchers doing it for themselves. All the money spent propping up the fat cats in the meantime will have been wasted. However, despite its obvious stupidity, the RCUK did give me one idea. I’ve blogged before about how much learned societies such as the Institute of Physics “earn” from their own publishing houses. In effect, these outfits are living on income provided to them by hard-pressed university library budgets. In such cases it can be argued that the profits at least remain within the discipline – the IOP does many good things with the money generated by its publishing arm – but is this actually an honest way of supporting the activities of learned societies? Anyway, it seems clear to me that the financial model under which most learned societies, including the IOP, operate will not operate for much longer, as more and more researchers go for Green Open Access and more and more institutions cancel subscriptions to their ruinously expensive journals. How then can they survive in the long term? Instead of splashing money around for Gold Open Access, RCUK should mandate that all its research be published in Green Open Access mode. That would pull the rug out from under the learned societies, but why not replace the funding they are syphoning off from journal subscriptions with direct block grants. Such grants would have to be audited to ensure that learned societies spend the money on appropriate things, and would probably amount to much less than such organizations currently receive. I don’t think that’s a bad thing. I think there’s a strong case for the IOP to be downsized, actually. So there’s my suggestion. No RCUK subsidy for the academic publishing industry, but direct subsidies for the learned societies and Green Open Access to be compulsory for all RCUK funded institutions.